This Cocktail Pouch Merchandising by Daily’s is a simple traditional solution to hook-hung sales. 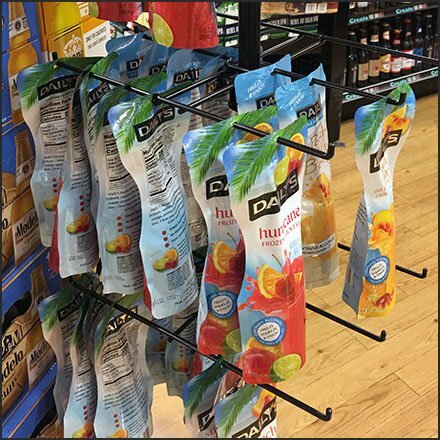 While more sophisticated Pouch Merchandising is available, Daily’s stays the course with a simple Spinner and 90º Tip Display Hooks with built-in Productstops. Possibly a Twist Cap Pouch, Neck-Hung display approach would be suited to multi-serve Cocktail mix offerings. These single serves are obviously seen more as a grab-and-go, then-you-throw item. This Cocktail Pouch Merchandising by Daily’s seen at Weis. For Pouch Merchandising posts by Title see..